Презентация на тему: "A lot (of) Much Many A (few) A (little) Урок английского языка в VII классе по учебнику О.В. Афанасьевой, И.В. Михеевой. Разработала: учитель английского.". Скачать бесплатно и без регистрации. 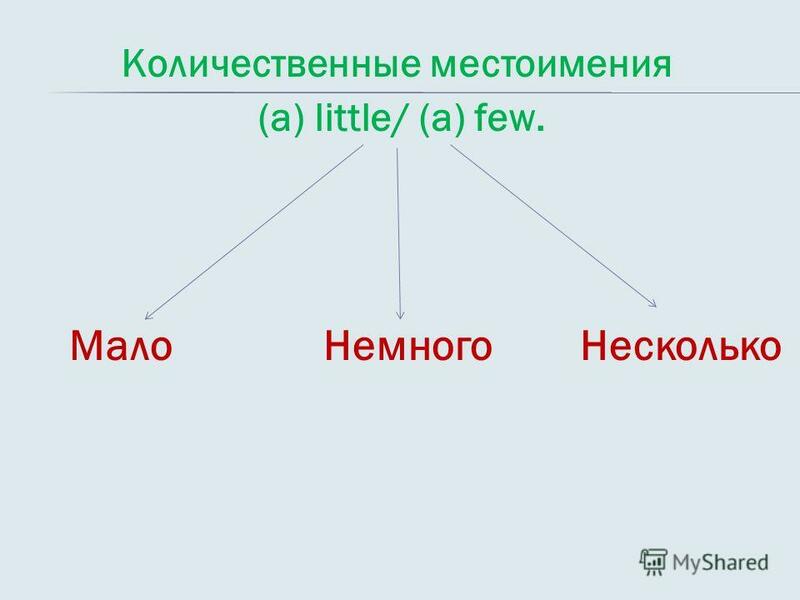 1 A lot (of) Much Many A (few) A (little) Урок английского языка в VII классе по учебнику О.В. Афанасьевой, И.В. Михеевой. Разработала: учитель английского языка МОУ СОШ 14 г. Владимира Потапова Т.В. 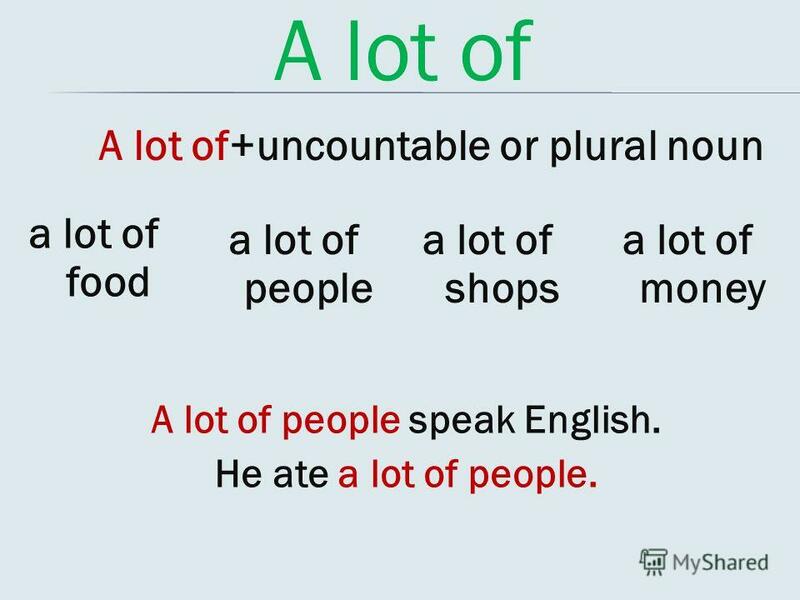 3 A lot of A lot of+uncountable or plural noun a lot of food a lot of people a lot of shops a lot of money A lot of people speak English. He ate a lot of people. 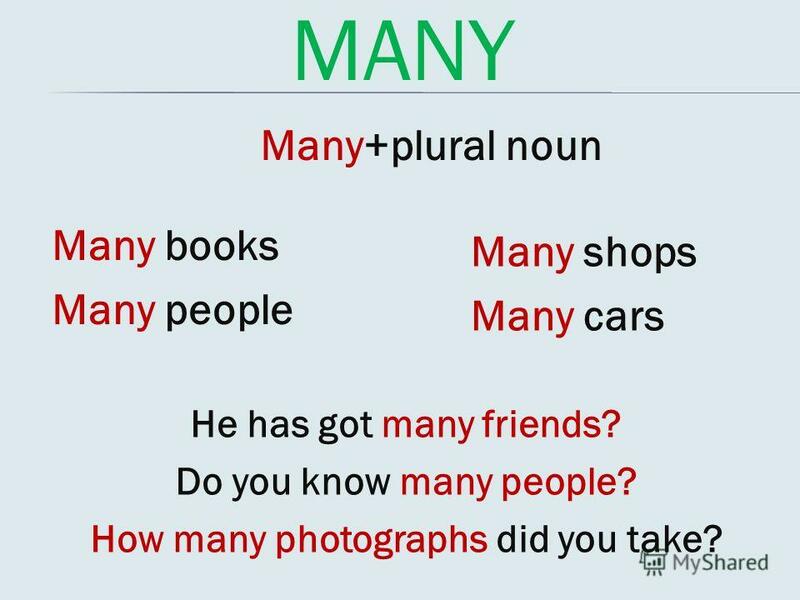 4 MANY Many+plural noun Many books Many people Many shops Many cars He has got many friends? Do you know many people? How many photographs did you take? 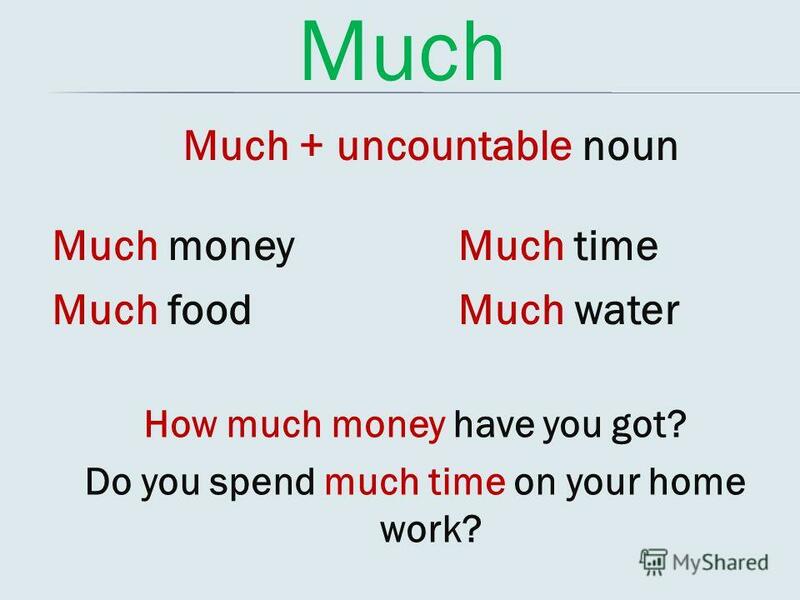 5 Much Much + uncountable noun Much money Much food Much time Much water How much money have you got? Do you spend much time on your home work? 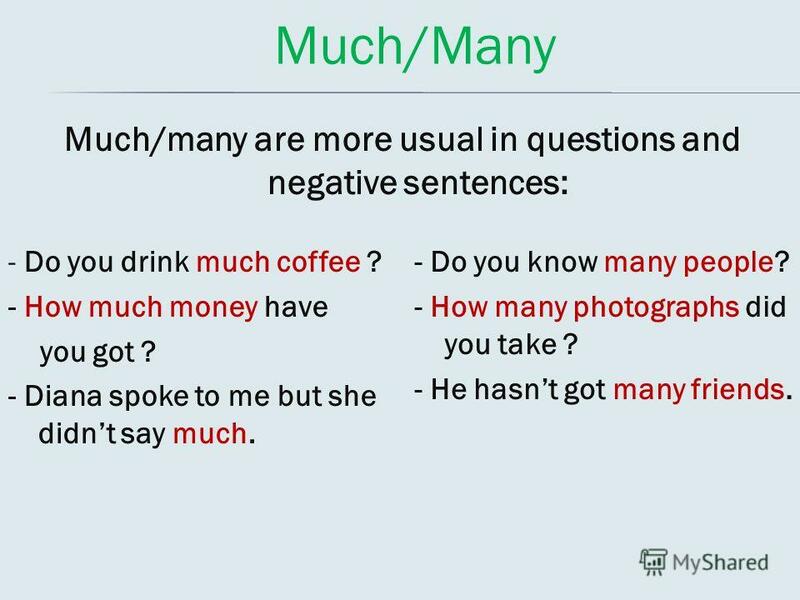 6 Much/Many Much/many are more usual in questions and negative sentences: - Do you drink much coffee ? - How much money have you got ? - Diana spoke to me but she didnt say much. - Do you know many people? - How many photographs did you take ? 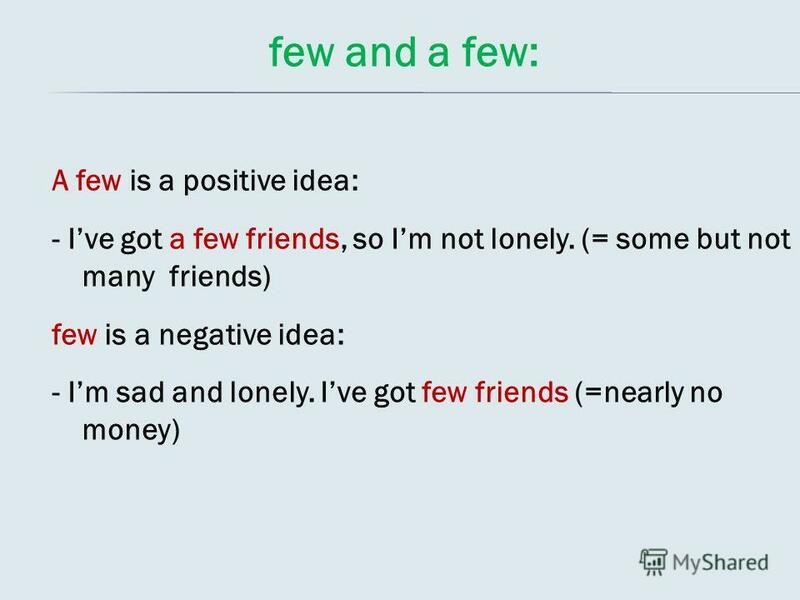 - He hasnt got many friends. 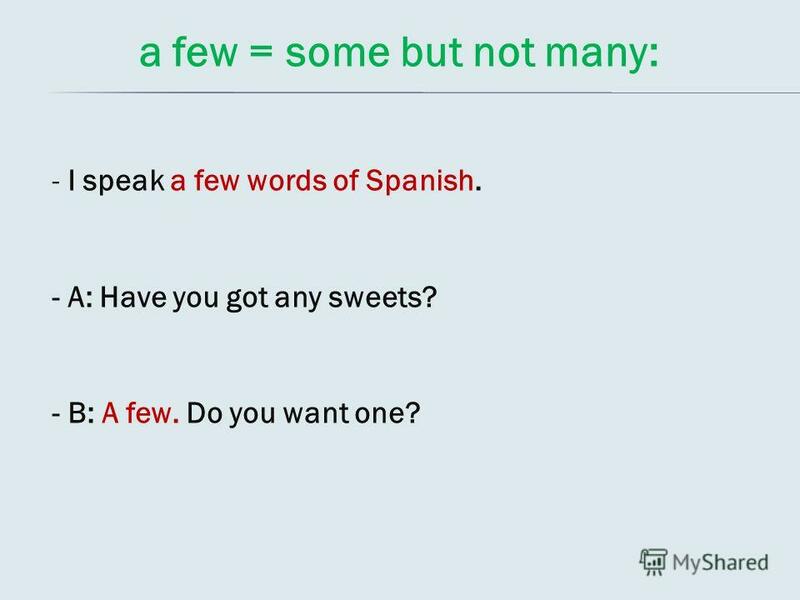 14 a few = some but not many: - I speak a few words of Spanish. - A: Have you got any sweets? - B: A few. Do you want one? 16 few (without a) = nearly no…: - There were few people in the park. It was nearly empty. 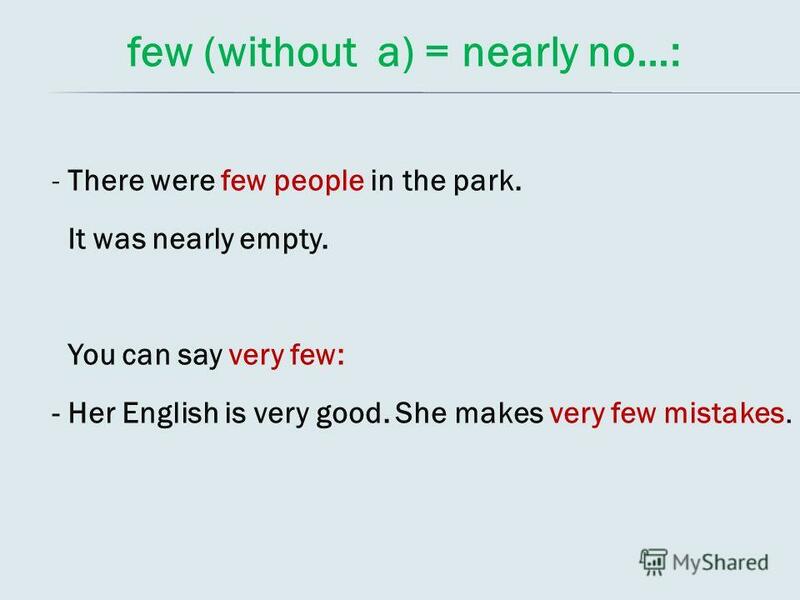 You can say very few: - Her English is very good. She makes very few mistakes. A lot, much, many, few, little.. Put in a lot of / much / many 1.Do you drink much tea? 2.I like reading. Ive got a lot of books. 3.There isnt much milk. 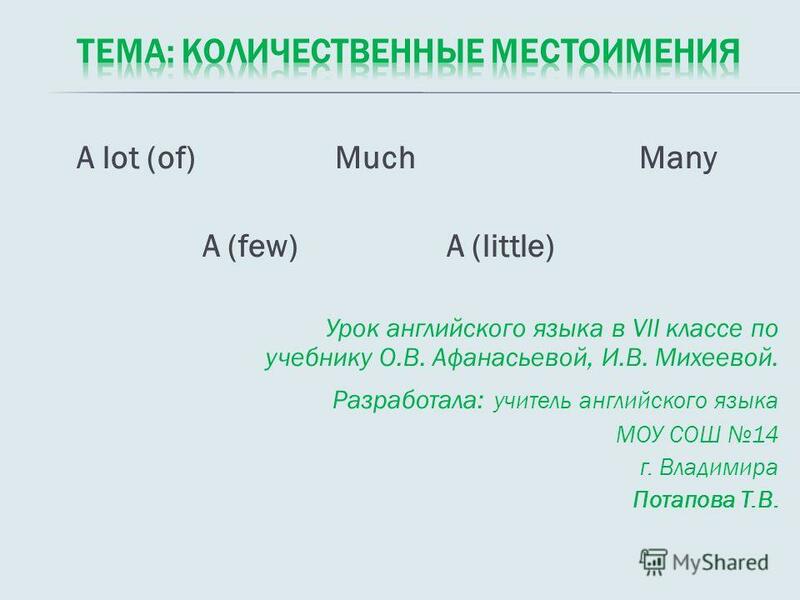 Местоимения some, any, much, many, a lot of, little, few. 6 класс Раздел 6 УМК Кауфман К.И., Кауфман М.Ю. Учитель МОУ СОШ 1 С. Октябрьское РСО-Алания Караева. SPEAKING ABOUT THE PAST Данилочкина Елена Сергеевна МОУ гимназия 36 г. Иваново Учитель английского языка. I am… What did you do yesterday? went for a walk went for a walk read a book read a book played computer games played computer games watched TV watched. Тема и задачи Местоимения much, many, a lot of,Местоимения much, many, a lot of, few, little Повторить местоимения much, many, a lot of, few, little. УЧИТЕЛЬ АНГЛИЙСКОГО ЯЗЫКА ГБОУ РМ РДДШ 1 ЕРМАКОВА ИРИНА ВИКТОРОВНА. 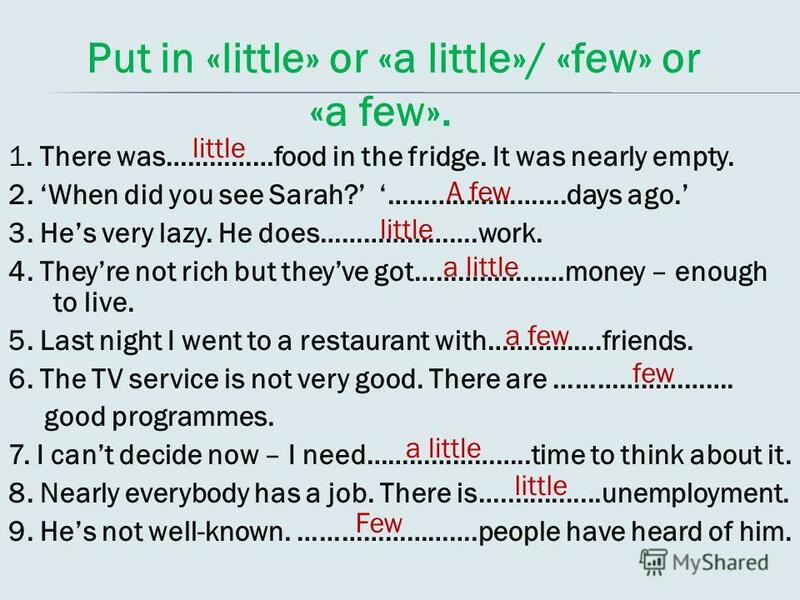 A Few/Few A LITTLE/ LITTLE. 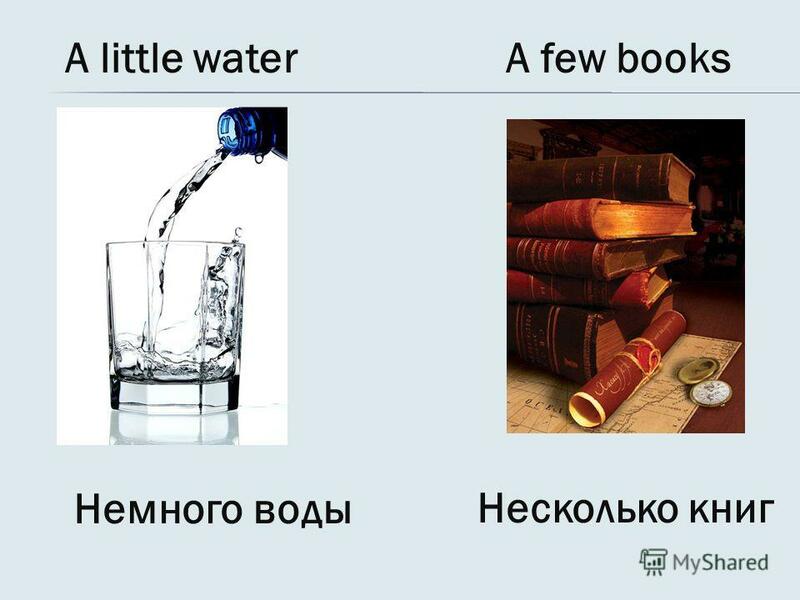 Мы используем a little/little с неисчисляемыми существительными (water, money, rice…). A little имеет значение «немного, но. 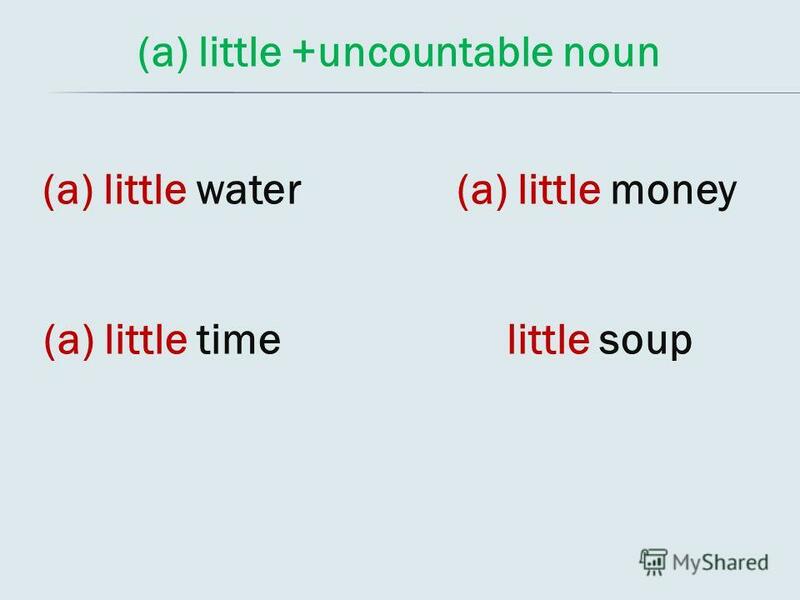 Lexical Test (little, a little, few, a few). 1. Tell me..... words about your family, please. 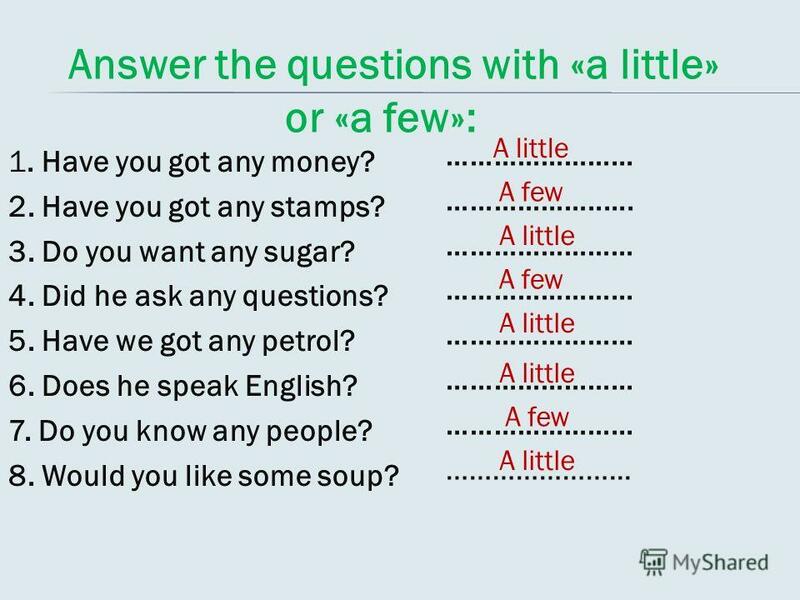 a) little b) a little c) few d) a few. 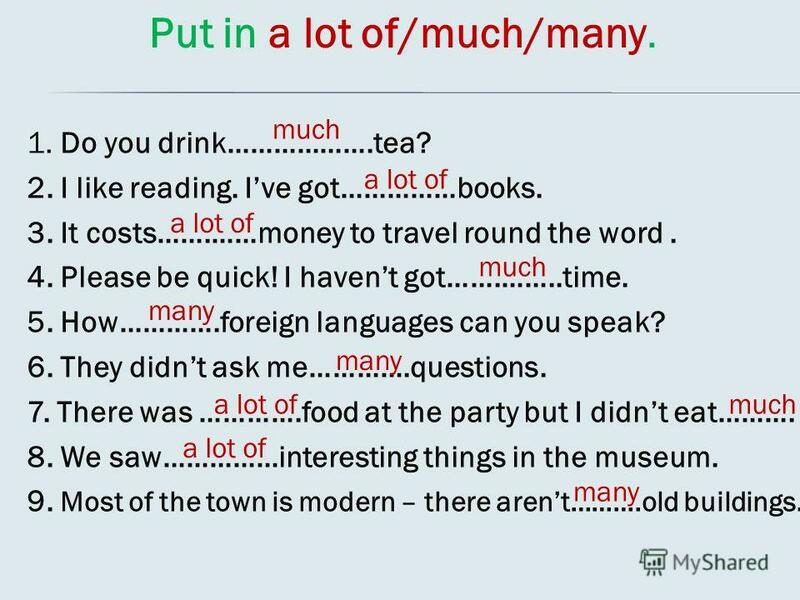 Much or many?. Can you count these things? flower sand boat water sugar grape. 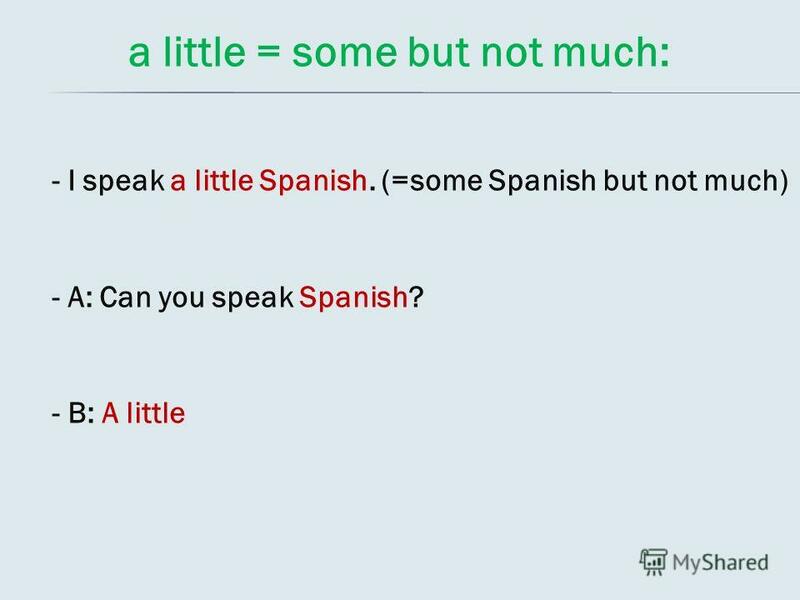 We use conditionals to talk about: a)real situations b) imaginary situations. ЗАДАНИЯ НА СОСТАВЛЕНИЕ ПИСЬМА ЛИЧНОГО ХАРАКТЕРА Task 1. You have received a letter from your English-speaking pen-friend Mary who writes... was great to. TAG-QUESTIONS. What are their types? 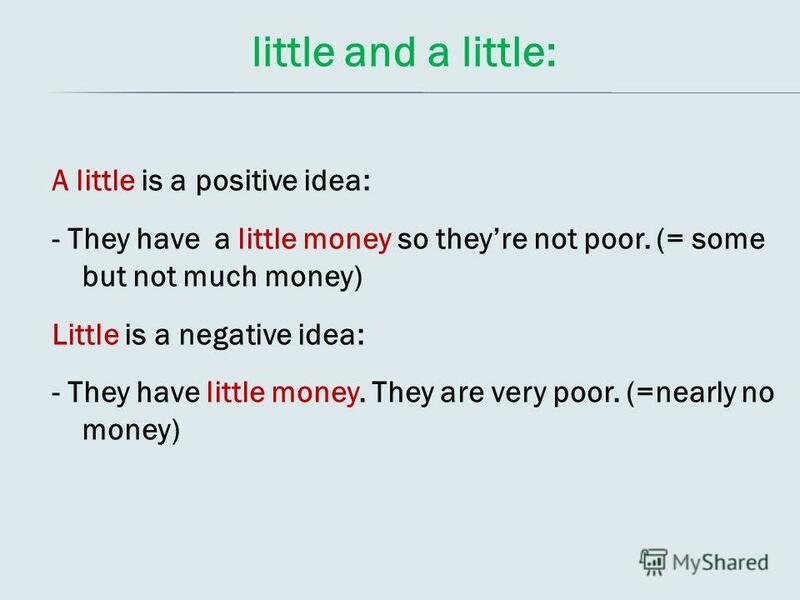 What are differences between them? Its a nice day, ? 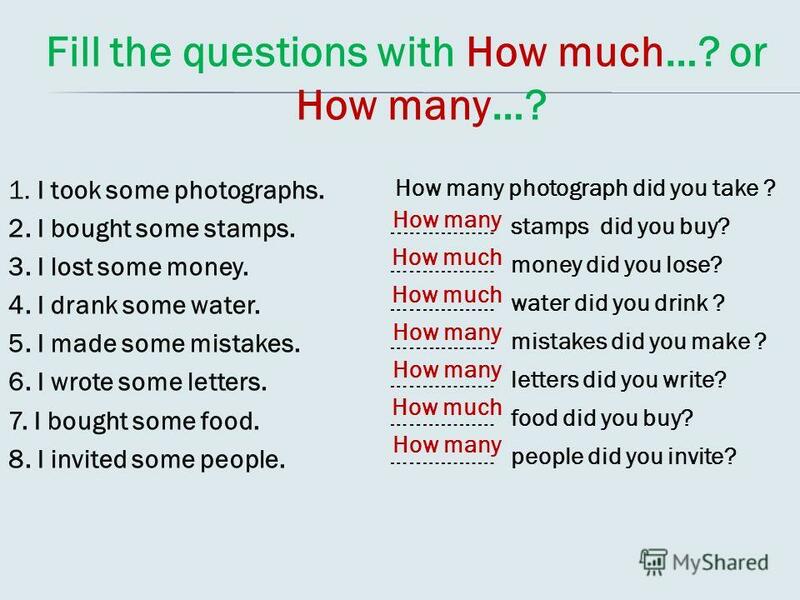 Complete each sentence with a question tag. isnt it. 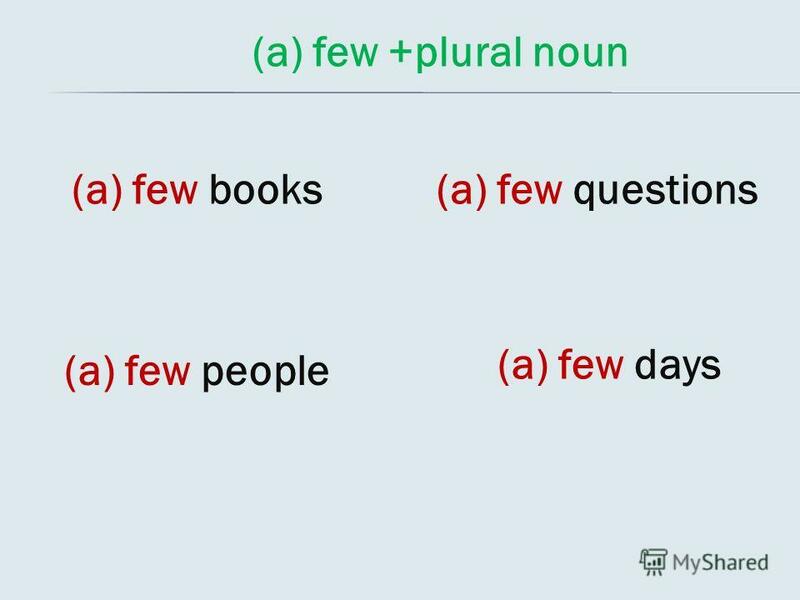 The topic of our lesson is The Past Simple Tense. Войцеховская Наталья Владимировна, педагог дополнительного образования МОУ ДОД Североморский Дом детского творчества им. Саши Ковалёва 2010. PRESENT FUTURE PAST INDEFINITE. USUALLY OFTEN EVERY DAY EVERY WEEK EVERY MONTH EVERY YEAR NEXT DAY NEXT WEEK NEXT MONTH NEXT YEAR YESTERDAY LAST DAY LAST. 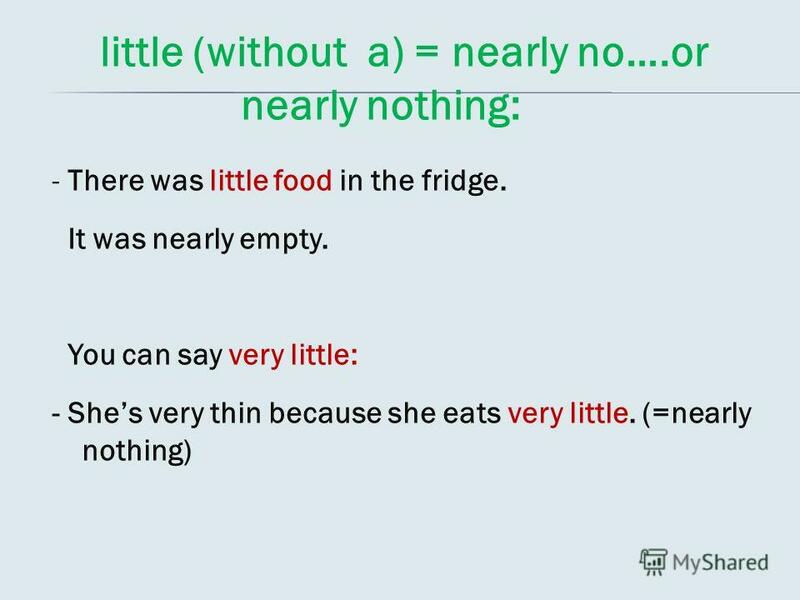 Some- -body Any- - thing No- -where Every- Part 2.